My kid was born yesterday!!! My wife was a beast and rocked it out citing, “wow that wasn’t as bad as I thought it would be” lol! <3 *Edit - an internal monologue was added to assist in the transfer between 86 and 88 on 6/4/2018... There was going to be a more serious one in 87, when I initially wrote this 2 years ago... That plot/dialog beat has been moved to a later comic and Nigel's continual struggles were added at 87 instead. tl;dr: I added something to this strip for coherency. agreeee… yeah, I had to reorder some panels due to different timing issues (this is what happens when you sketched and wrote something 2 years ago, and are just now digitizing it, lol). I should put “a few minutes later” on this 1st panel… :/ I’ll prob go back and add it. *Edit – an internal monologue was added to assist in the transfer between 86 and 88 on 6/4/2018… There was going to be a more serious one in 87, when I initially wrote this 2 years ago… That plot/dialog beat has been moved to a later comic and Nigel’s continual struggles were added at 87 instead. tl;dr: I added something to this strip for coherency. I’d argue that the beer helmet should also reduce your AC and give a penalty to dexterity. It doesn’t provide any advantage over quaffing your potions from the belt. Unless you’d argue that it makes quaffing a free action. 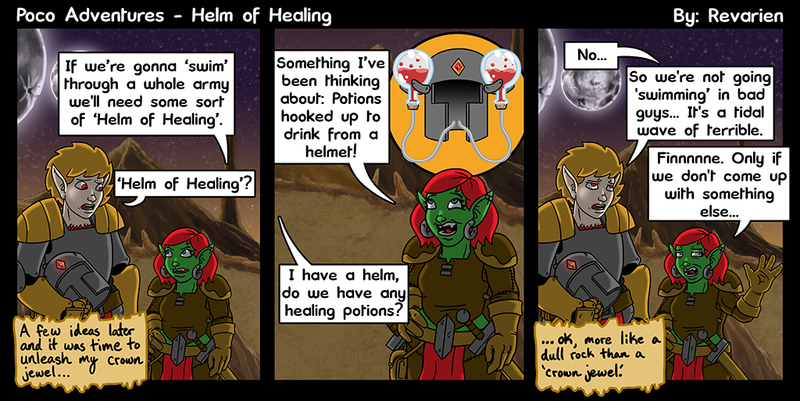 In which case there would be an advantage to a helmet doubling as a flask. But your helmet would still carry penalties, if only from the additional weight of the liquid contents, and the risk of it leaking when hit. And if you need to partake of a healing potion that often, you’re probably doing something wrong to begin with. So there is probably a good reason why it isn’t a staple in fantasy settings.